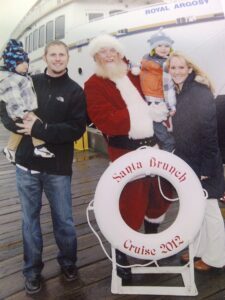 Each year Argosy Cruises hosts their annual Santa Brunches. For 2013, they run November 24th through December 23rd, aboard the Royal Argosy. They are each Saturday and Sunday between 11am – 1pm. 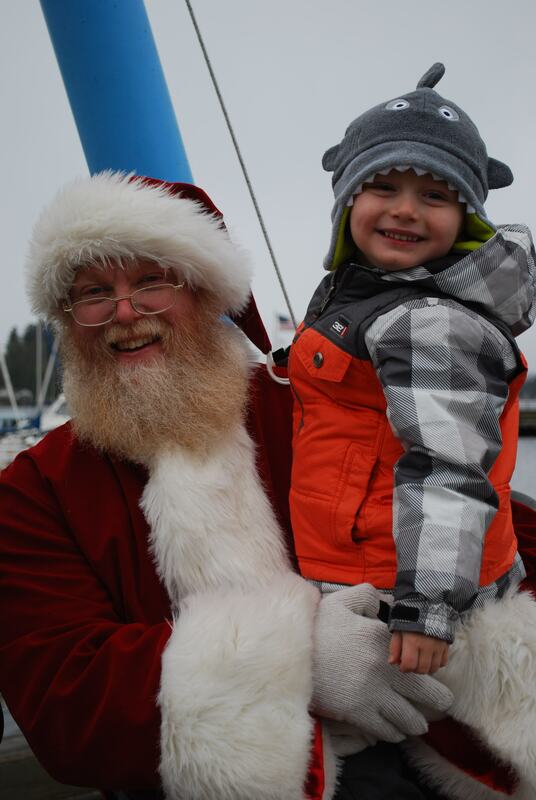 When we arrived, we were immediately greeted by Mr. Claus himself! 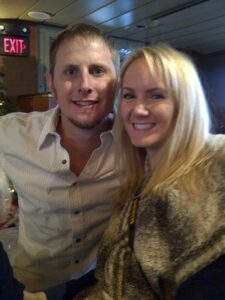 I have to say I was amazed at how many times we personally came into contact with Santa. It wasn’t just a one-time occurrence. By the end of the cruise, I swear he knew my sons personally and could recount their wish-list by heart. On board, we were treated to a fantastic holiday brunch menu featuring French toast, bacon, mini cinnamon rolls, fresh fruit, waldorf salad, mac n cheese for the kids… the works. We didn’t leave hungry! Momma tip: While you’re waiting for the servers to get the buffet prepped, head downstairs to the arts & crafts section (that Argosy so smarty arranged) so your kids don’t have to stay put at their tables. 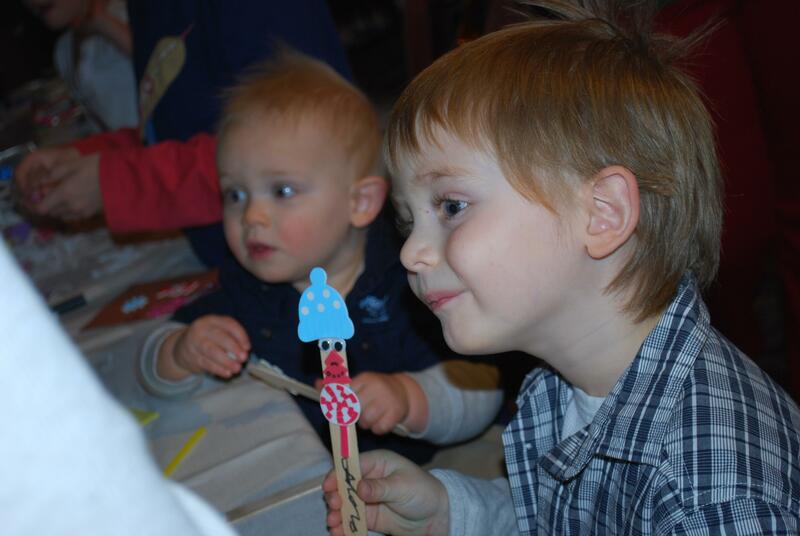 My kids tried their hands at little reindeers on a stick that turns out very cute. My husband and I decided to partake in a little bit of the festive holiday beverage fare (Mimosas and Royal Mocha Java); although they aren’t part of your ticket price, they just may be worth it if you have two little ones under the age of three. Momma Tip: Use this time as a family friendly expedition, but make it a “date day” in its own right too! After brunch, we loved listening to the entertaining stories, as told by Santa’s elves, gathering in a circle for ‘Twas the Night Before Christmas read by Santa himself, and watching our boys get a little trinket from Santa’s bag of toys. It was a very festive day! Even in the cold, it was time to explore the outside of the ship. Momma Tip: As the Royal Argosy was docking, we were the only family to head to the very top deck to watch Captain Karen dock the boat. We gave her the space she and time she needed (I hope!) to take her time for a safe docking. And when her docking was complete, guess what she let us do?? The boys got to take a quick look inside the Captain’s quarters at the wheel! If you don’t have plans between now and December 23rd, book your spot today! Kimberly Ellertson is the Director of Marketing for the Greater Woodinville Chamber of Commerce, also the place she calls her hometown. She’s a wife to an adventure-seeking husband and momma to two active young boys. She and her family enjoy exploring and outdoor adventure around Washington State. She’s also known to enjoy a girl’s night out with a glass of #WAwine from Woodinville in hand!